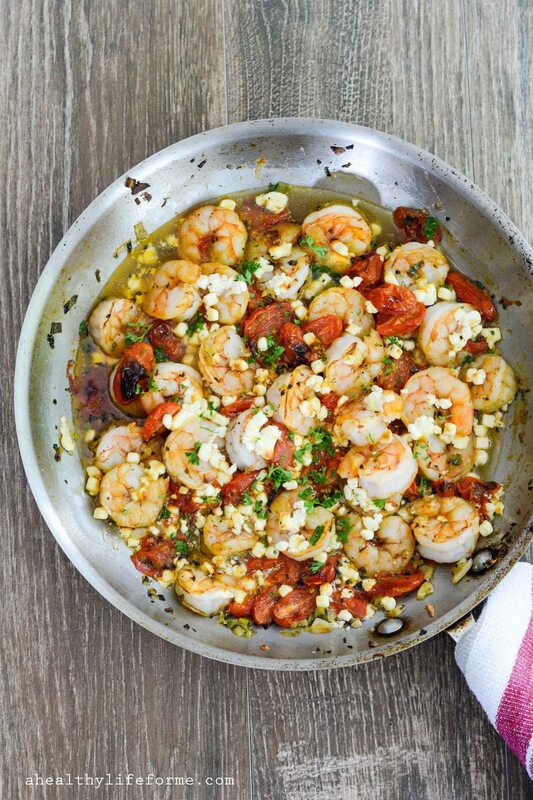 Baked Shrimp with Tomato and Feta is an easy, delicious, gluten free and healthy dinner that is made in one skillet and ready in less than 30 minutes. Everyone has a few recipes that are family favorites. Reasons can differ as to why they are favorites, but for a cook her favorites usually have a list of requirements. For me the first one must be that everyone I love, must love the recipe. Silly I know but really being a cook, you really only enjoy your recipes when others enjoy them. Even if you think your recipe is the most incredible thing you have ever made, but those you feed it too, don’t. You won’t have a warm and fuzzy feeling about the recipe. Let’s face it, food is all about emotion. The second requirement is it can’t be too fussy. I have made many recipes that have been out of this world amazing, but they took hours to prepare and I was usually just happy the thing was done, and on the table, not caring too much if it was enjoyed or not. The third requirement is all for selfish reasons! Clean up, the less I have to do, the more I love the recipe. Let’s face it if the cook has to spend just as much time cleaning up as she or he did making the dish, you probably won’t see it on your table again. That brings me to this delicious, SO DARN EASY, recipe that is made in one skillet and is ready in 25 minutes, and of course all those that I love, love this dish. It even extends to my sister-n-law who has told me that this is a favorite in her house too. So, start shelling your shrimp and preheating your oven and get to making this dish. Make sure you stop back and let me know what you think, how much you loved it, etc. etc. You get the idea. Preheat oven to 475° with rack set in upper third of oven. Add tomatoes, salt and pepper, stirring to coat with oil mix and cook 3 minutes, or until tomatoes start to blister. 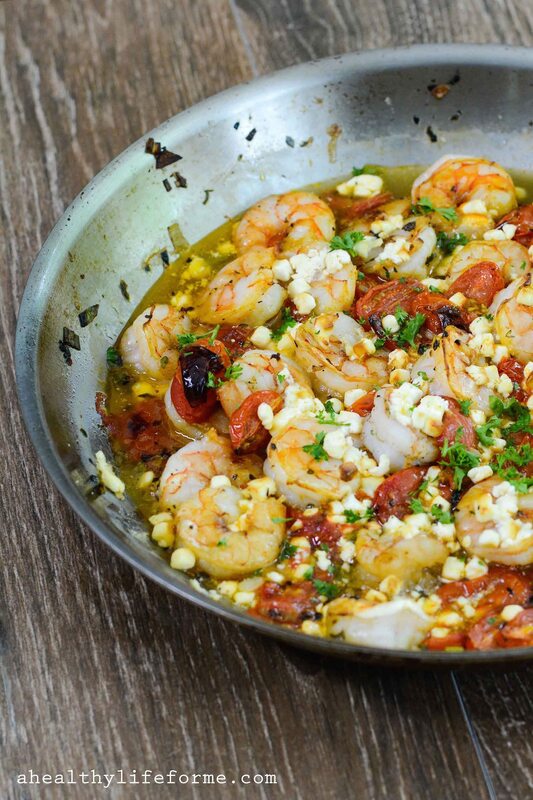 Add shrimp to skillet and top with feta. Place skillet in oven and bake for 10-15 minutes, liquid will be bubbling, shrimp with be pink and cheese just starting to brown at edges. Remove let cool a few minutes sprinkle with fresh parsley, plate and enjoy. Note: Because of the high salt content in Feta it will not melt, but brown on top. The baked shrimp with tomato and feta was so delicious! Great recipe!! I put it over zucchini noodles!! Oh that is a great idea Lisa. I will have to give that a try! Thanks for trying the recipe and letting me know what you thought.